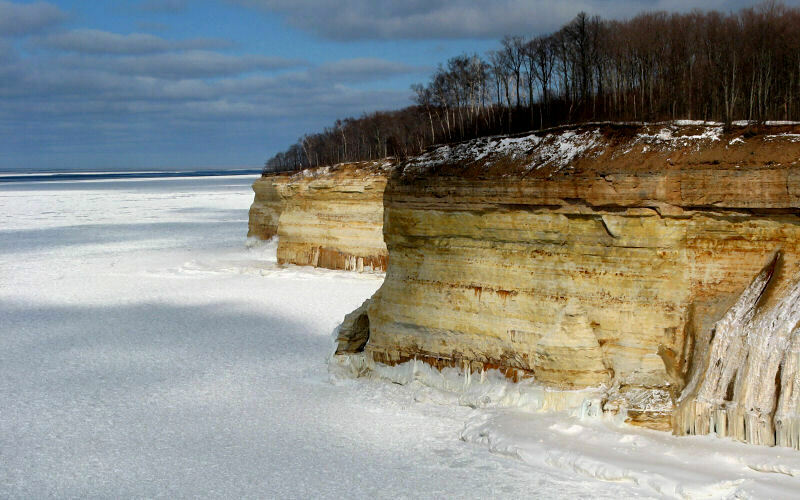 In winter, the beaches and cliffs of Pictured Rocks are generally insulated by 3 miles of unplowed roads, ensuring that only the most determined travelers will ever see them. In order to enjoy a day hike into the backcountry, you have to sort of enjoy not enjoying yourself. If you heard about the CIA waterboarding process and thought to yourself "that's not torture! that sounds like fun!" 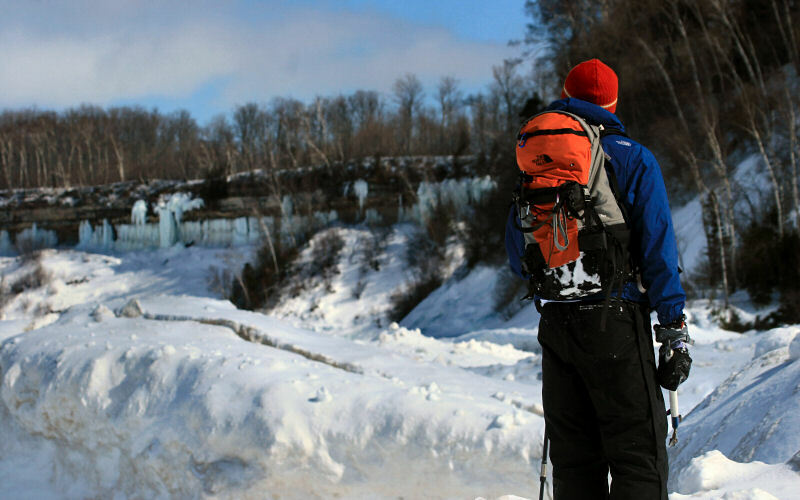 then you might enjoy one of these hikes. I mean it's not as bad as watching an entire episode of the Gilmore Girls, but getting deep into the backcountry in winter involves a fair amount of pain and perserverance. 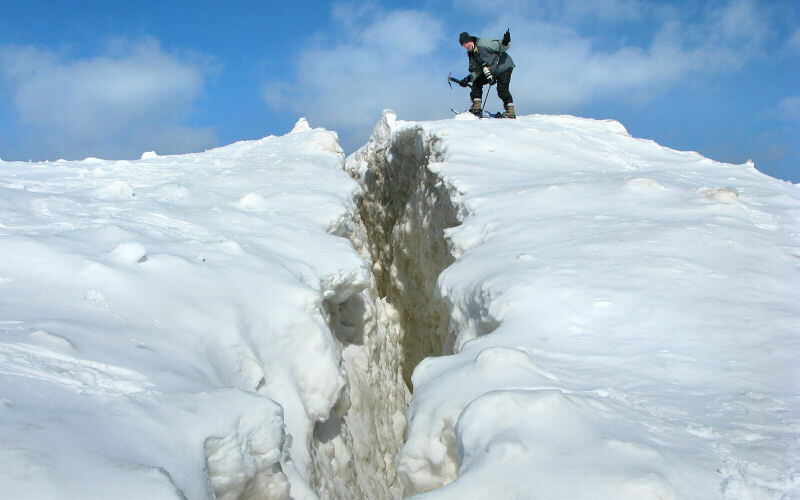 In the winter the weather is less hospitable, you have to hike farther, you have to carry more, the risks are higher, and snow generally takes more effort to move through. However, you will also see things that few people see. We started where the plowing ends on Miners Castle Road. 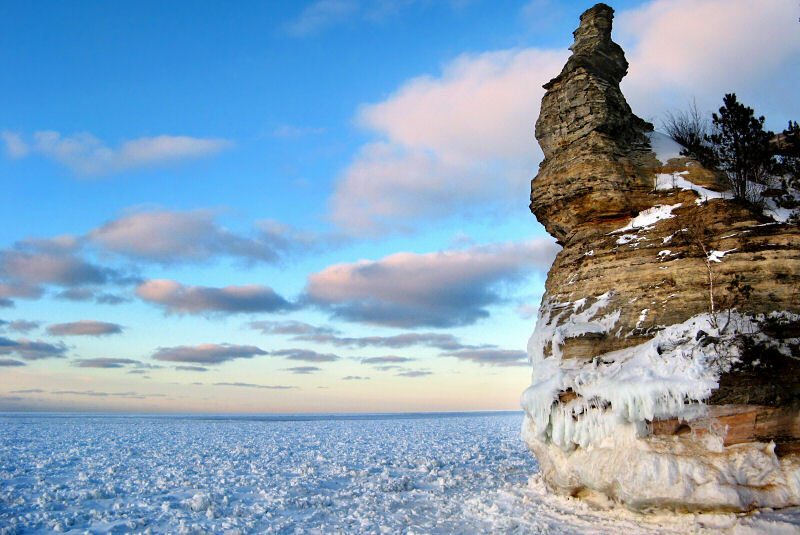 I skied straight to Miners Castle for a quick look while Kai headed to Miners Beach, where I met up with him later. I think we only saw a couple snowmobilers on the road but this area can get busy on weekends. 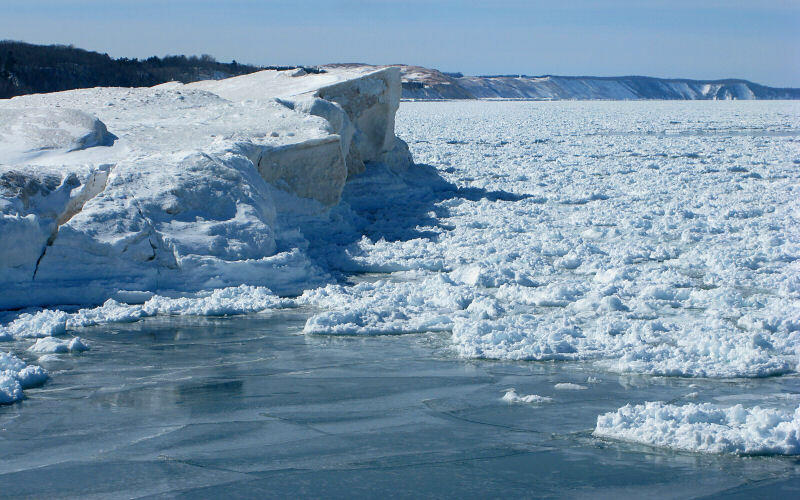 There was more ice on the Lake than I had ever seen due to the relatively cold winter we had this year. 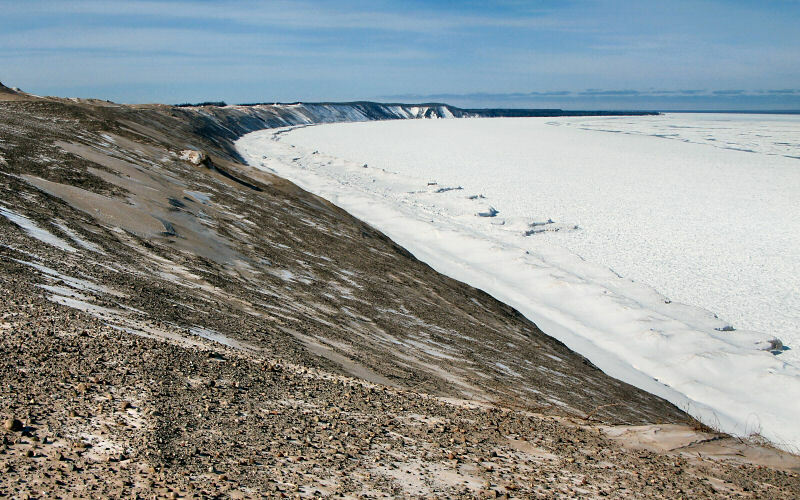 We stopped for a quick snack on Miners Beach before wandering around on the ice shelf for a bit. 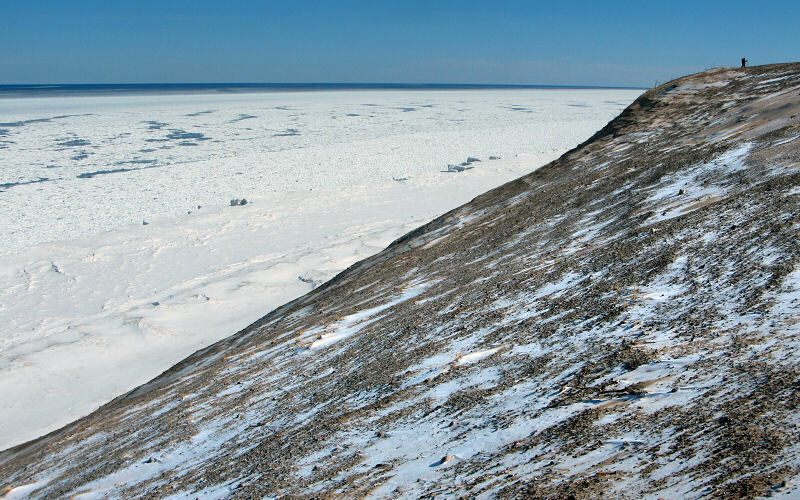 As we headed northeast, we soon saw that we wouldn't get far on the ice so we followed some tracks up a steep embankment to the top of the cliffs. Once we found the Lakeshore Trail we also found a group of ice climbers who were on their way to climb Bridal Veil Falls. We headed on past them to the viewpoint that overloooks Mosquito Beach. From the viewpoint we could see lots of interesting ice formations caused by wave action but we were tired and running out of time so we had to just admire them from a distance. As we passed by Bridal Veil on our way back we stopped off and watched the ice climbers for a bit. 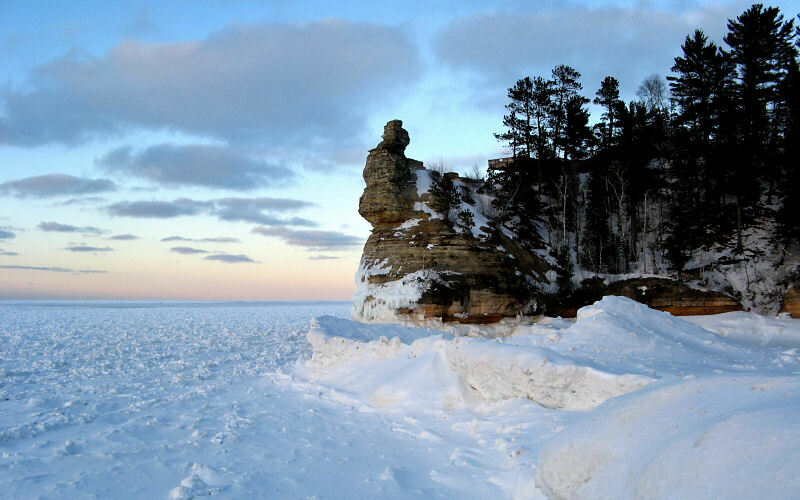 The climb didn't look too challenging but it is a really cool location to climb with Lake Superior right at your back. 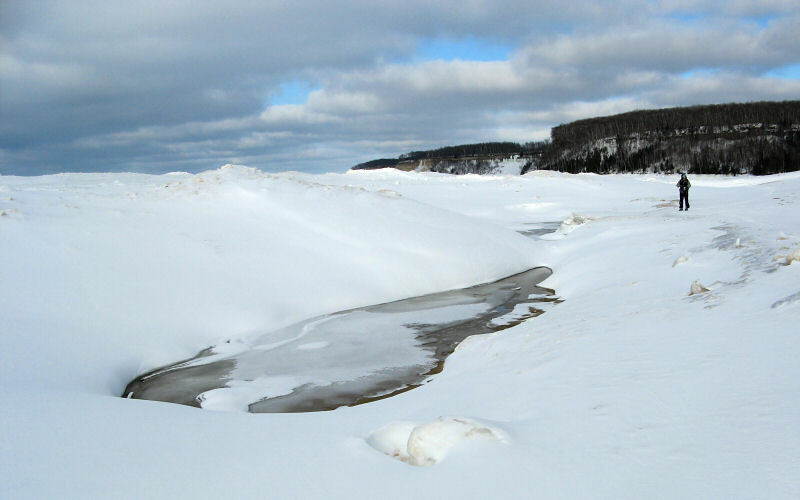 Once we got back to Miners Beach we had to decide if we would just take the road back to Miners Castle which gets there in a roundabout way, or if we would take the trail which was probably more direct but not skiable. We took the trail which was a bit hard to follow in the snow, but since there were no leaves on the trees there were some nice views looking out over Lake Superior. We arrived at Miners Castle just before sunset and hung out for bit taking photos before making the long trek back to the car. I mean, it was only about 3.5 miles but dang did it feel far. It was dark now and the cold was starting to get to me, even after I put on an extra layer. I just kept looking ahead, hoping I could catch my headlamp reflecting off the distant car. We hiked/skied 16.8 miles total and were outside for 11.5 hours. Weather was sunny with a high of 18F and a low of 0F. Probably drank about 1.5 liters of water. It was cold enough to freeze the water bottle on the outside of my pack and sunny enough to give me a bit of sunburn. It's a 6 hour drive to Pictured Rocks from Ann Arbor and Kai and I listened to the same CD over and over for the entire drive up there and back: Paramore's Riot. When we got back in range of Detroit radio stations we turned on the radio and they were playing Paramore. I'm not sure what that means. Note: Walking on ice can be dangerous and should be left to trained professionals, and idiots (like us). It's hard to appreciate the size of Miners Castle from a photo so I told Kai to rappel down the cliffs and stand next to it, for scale. We turned around at this viewpoint which looks towards Mosquito Beach. 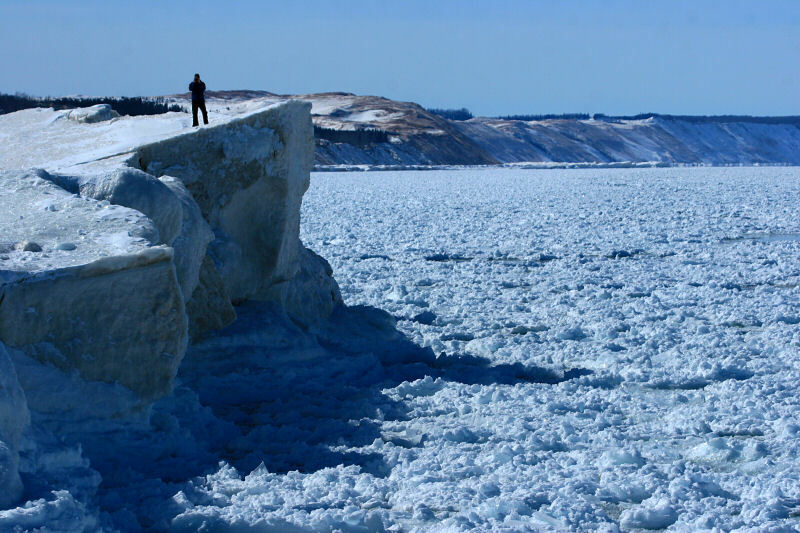 The edge of the ice shelf, far below. 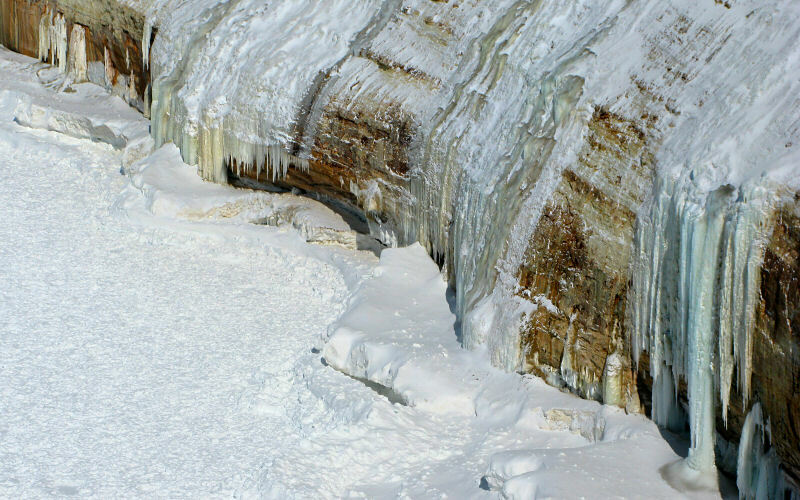 An ice climber climbing the frozen Bridal Veil Falls. The back side of Bridal Veil Falls. 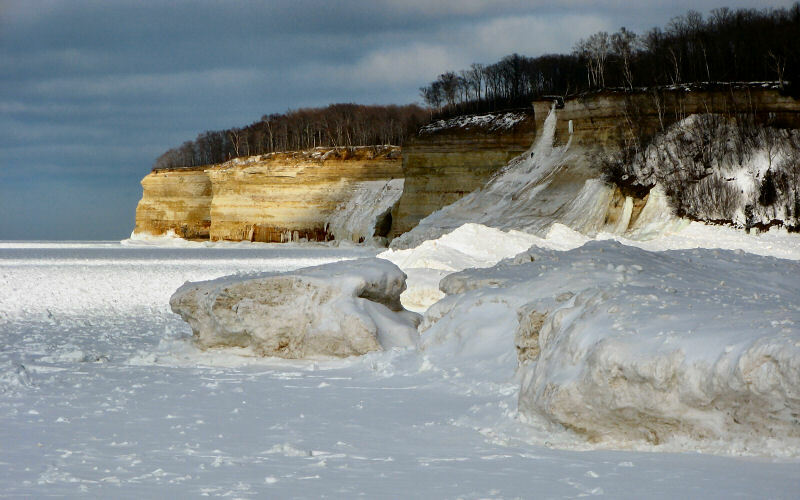 Cliffs northeast of Bridal Veil. 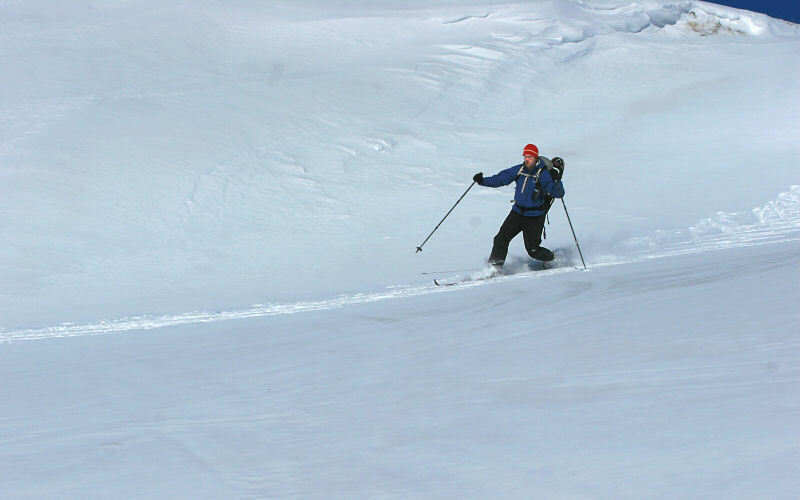 Me skiing down the bluff on Miners Beach. I almost lost it when I hit the drift at the bottom (Photos by Kai). 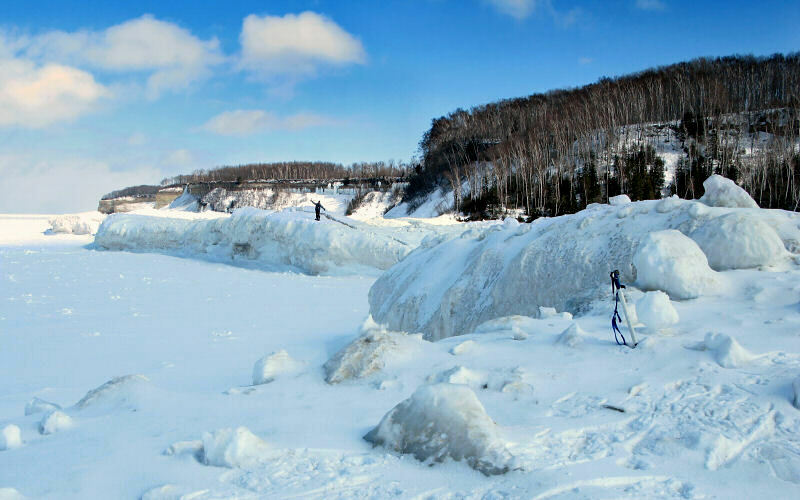 Kai skiing on Miners Beach. It might be a bit uncomfortable, but I bet you could get a tan twice as fast if you sunbathed here instead of a normal beach, due to the reflection off all the snow and ice (I got sunburn). Kai upon our arrival to Miners Beach. Contemplating the next move (Photo by Kai). 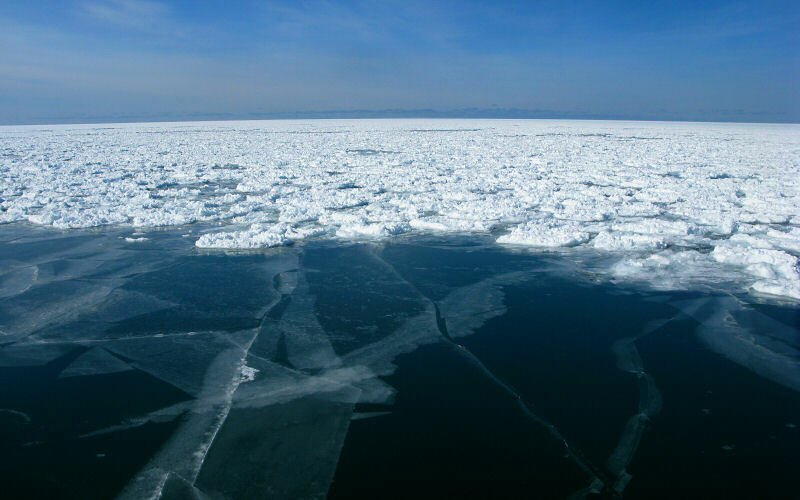 Left: The edge of the ice shelf (Photo by Kai). Right: Shadow lines. 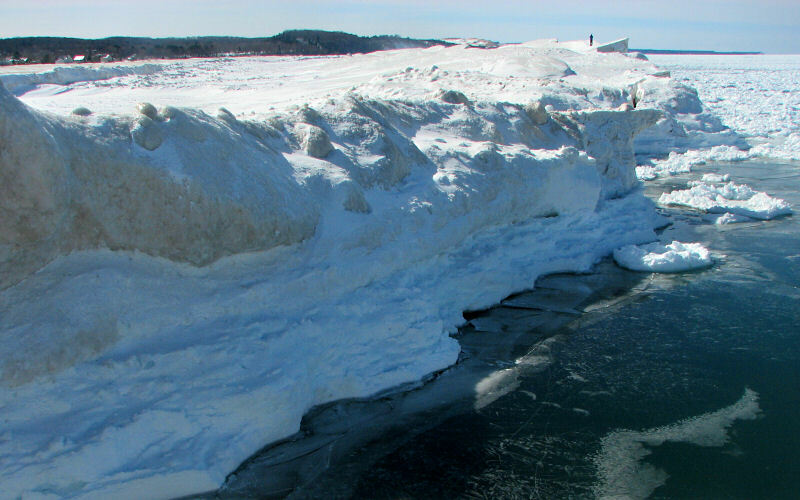 Ice shelf at Miners Beach. 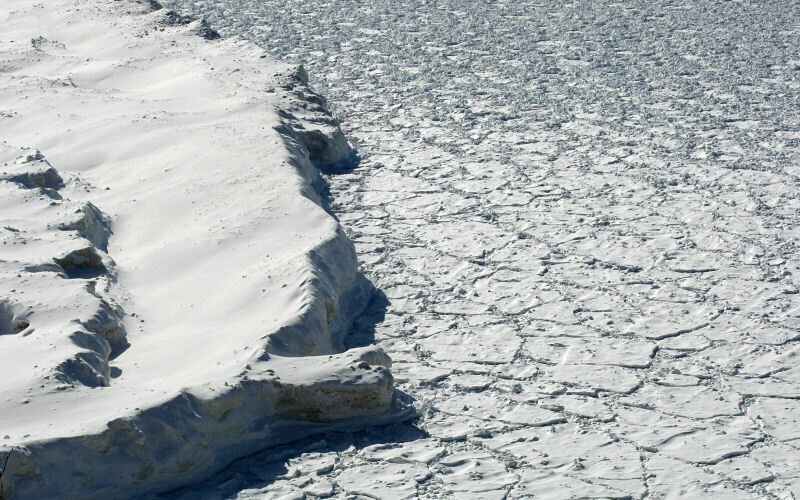 A fault line in the ice shelf. Lover's Leap (Photo by Kai). Left: Kai reaching the top of the hill-cliff we climbed. 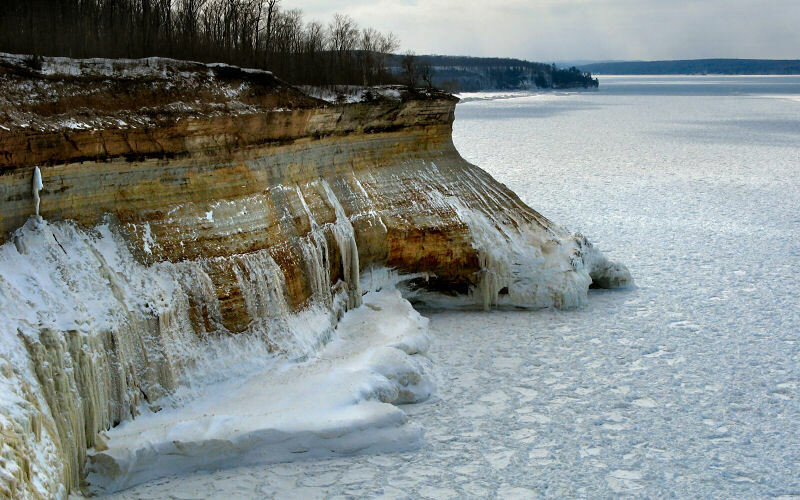 Right: Me in the ice ridges on Miners Beach (Photo by Kai). 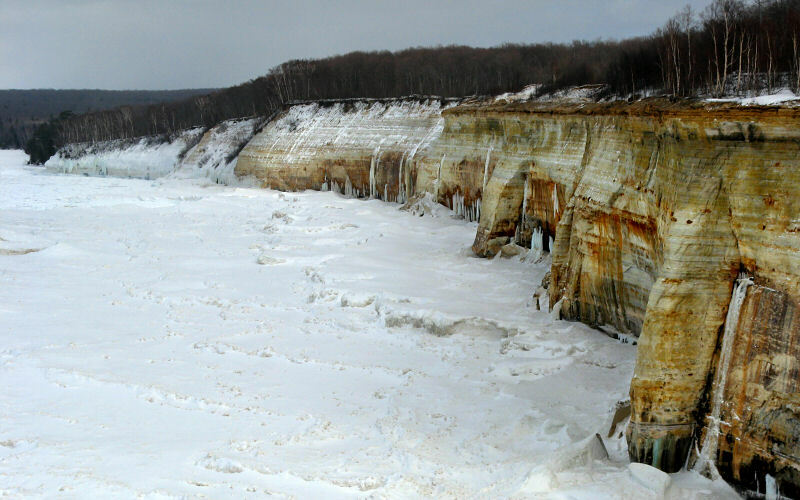 A cliff iced by wave spray (Photo by Kai). An ice climber on Bridal Veil (Photos by Kai). 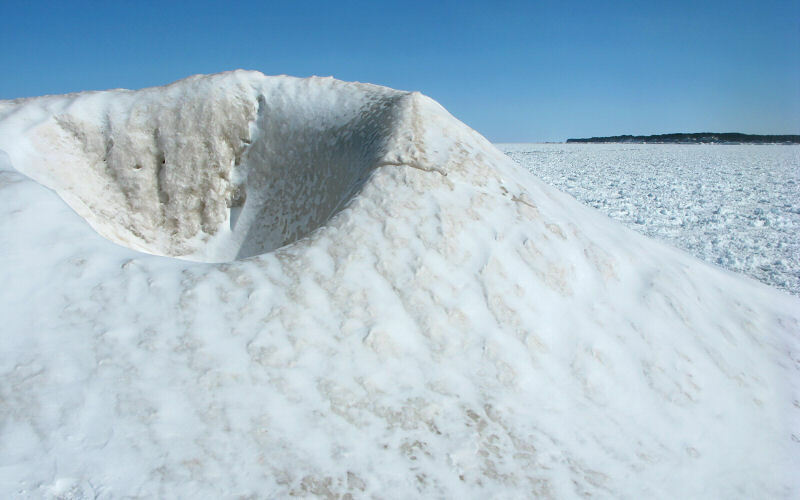 Ice pile on Miners Beach. 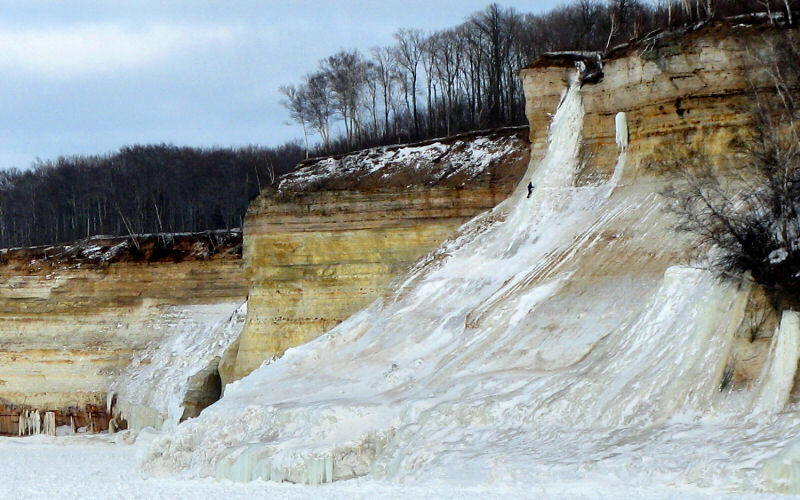 This is a big pile that drops off to lake level on the other side, those ice chunks you see are probably about the size of a cantaloupe. Left: Kai on the lake below. 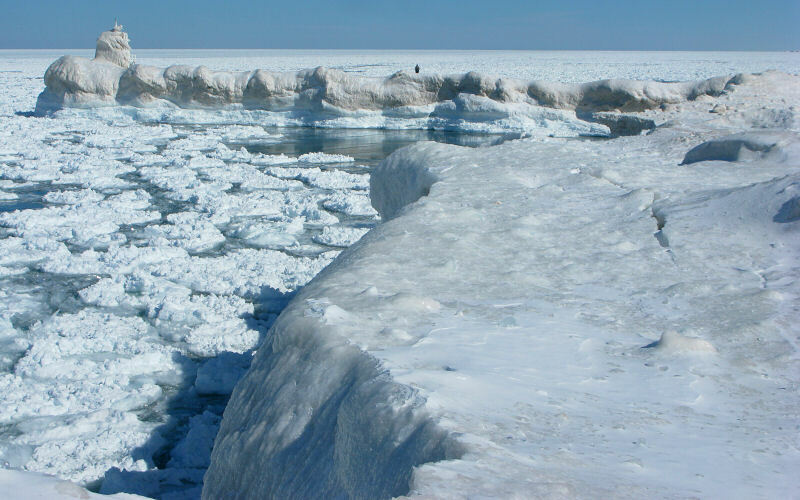 Right: The ice shelf at sunset. 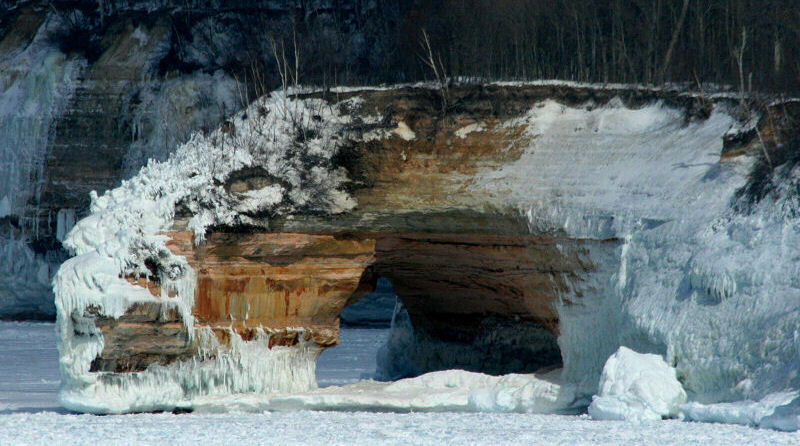 Miners Castle from the ice. 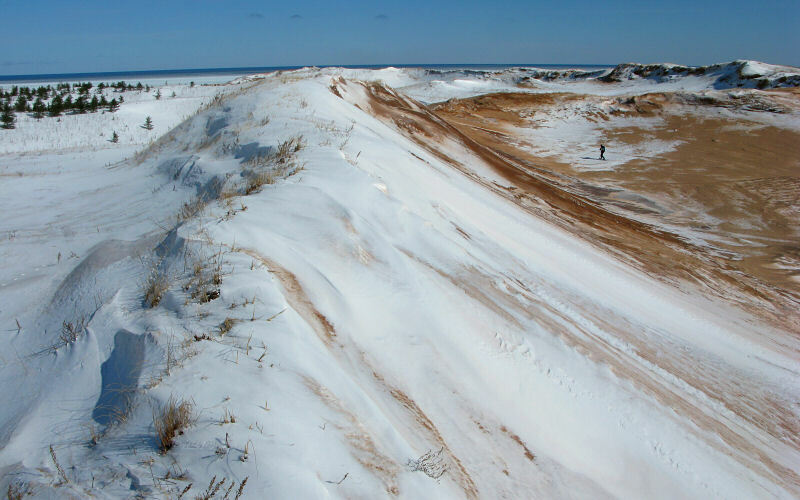 They had 3 feet of snow in Grand Marais but I wasn't sure what the conditions would be like on the dunes because the snow in areas like this tends to get blown around. 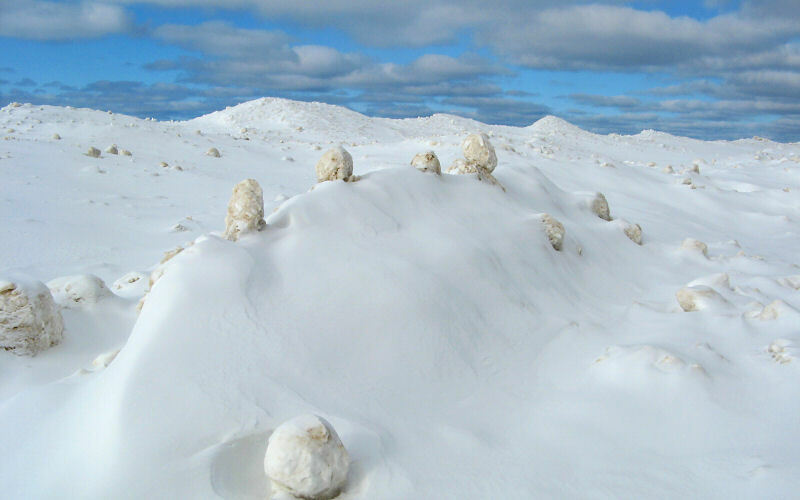 Turns out it is a great place to snowshoe although there are many places where the snow gets totally blown away, leaving rock hard frozen sand. 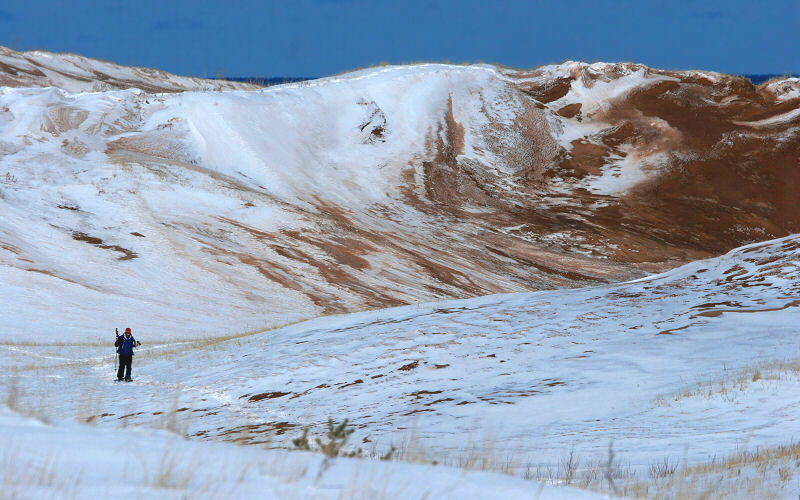 The thing that makes it great, though, is that the dunes are very contoured with all sorts of fun ridges to walk along and in the areas with snow, you can run or jump down the dunes without having to worry about tripping over some log that was buried in the snow. Oh yeah, and the views are amazing; you can see for miles in many directions. 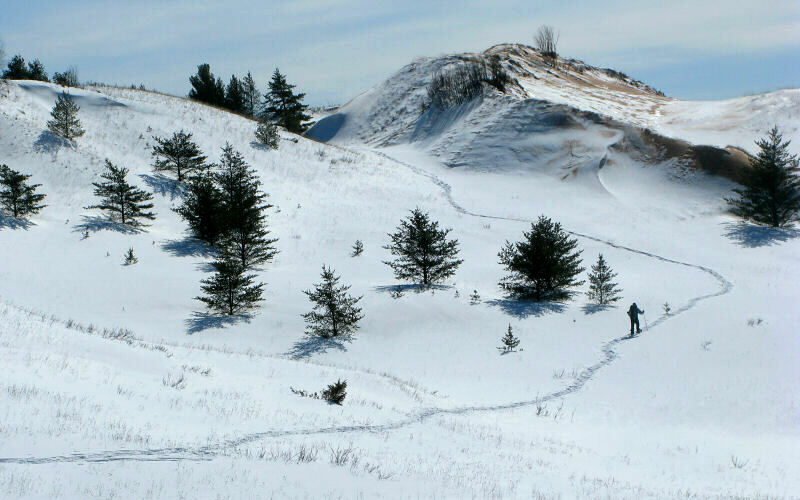 In short, this is the most fun I have had snowshoeing. We hiked 4.1 miles. Weather was sunny with a high of 22F and a low of -5F. Kai on the dunes. 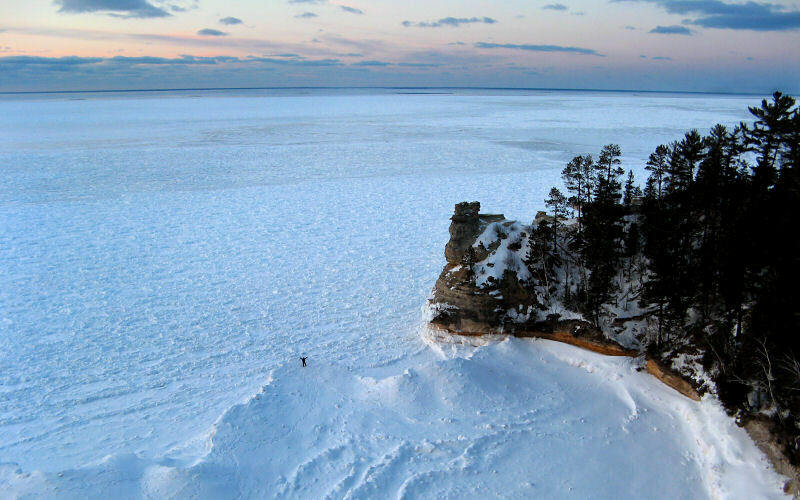 The dark line on the horizon is Lake Superior. 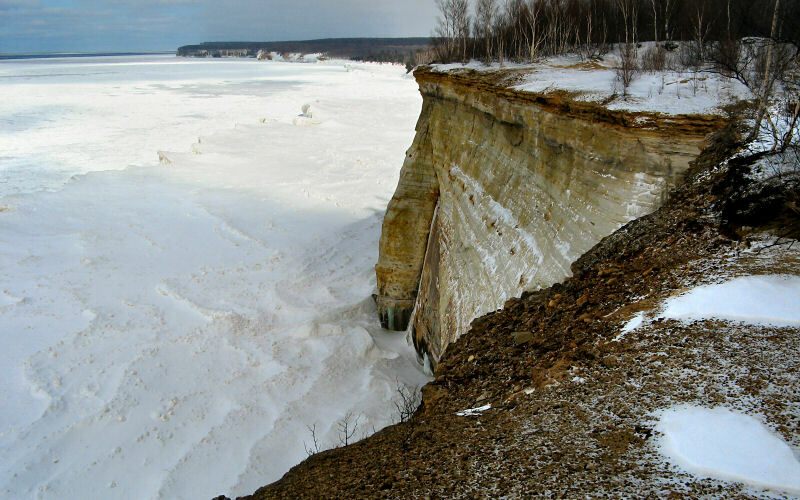 Looking towards Au Sable Point from the edge of the bluffs. Me below the dunes (Photo by Kai). 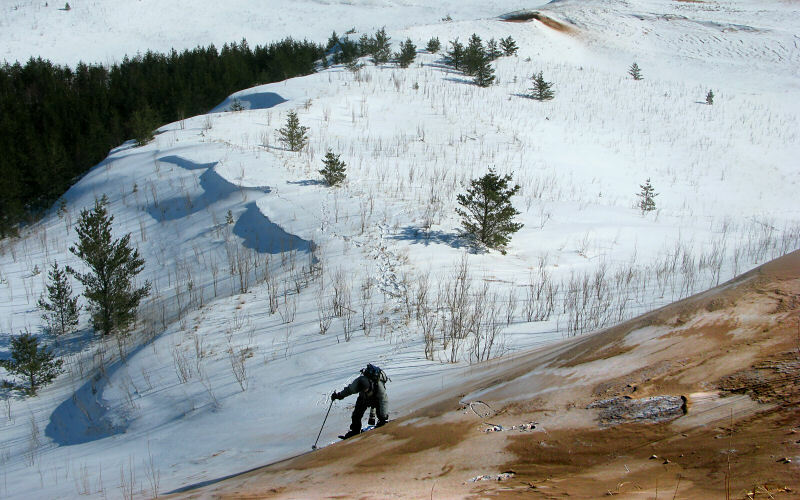 Me skiing down a dune (Photo by Kai). 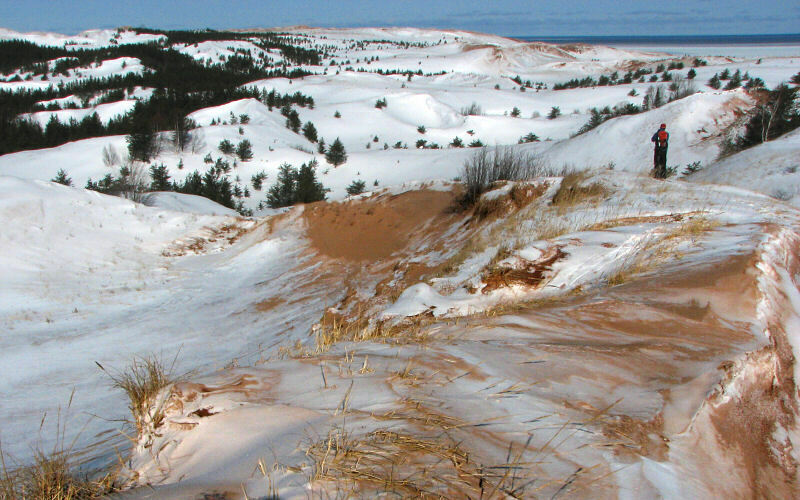 The view north from near where we first climbed onto the dunes (Photo by Kai). Kai following our trail back. 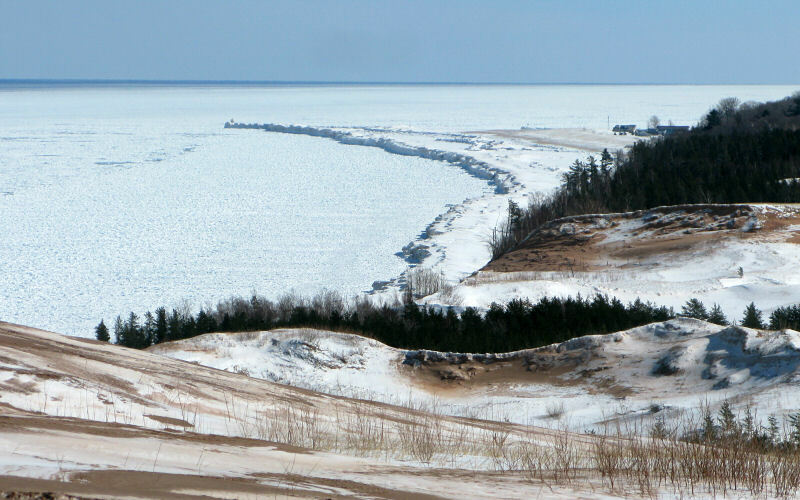 Grand Marais pier as seen from the dunes. 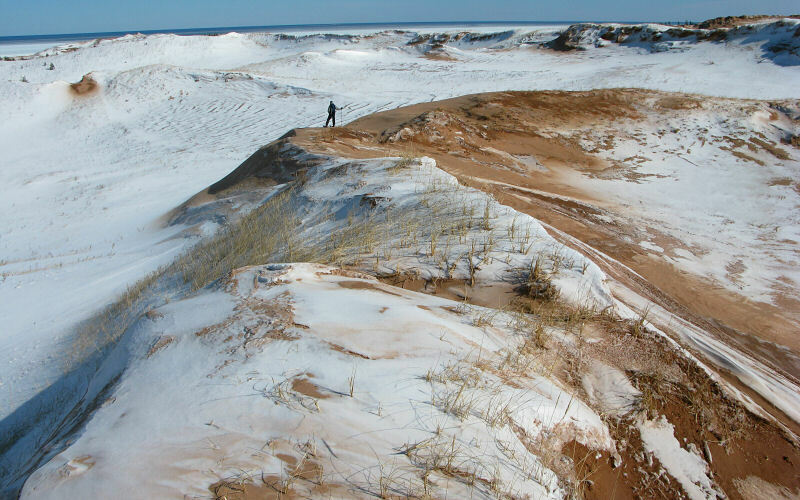 From the dunes, we saw that the Grand Marais pier was all coated in ice so we figured we had better check it out. We had crampons and ice axes in the car but that's where we left them. We thought we were just going for a nice long stroll on a short pier, like everyone always tells us to do. 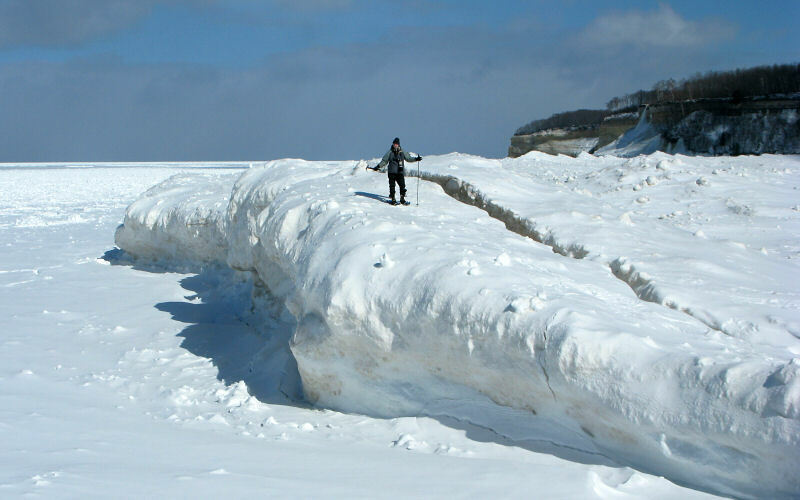 However, once we got closer we saw that the pier, lighthouse, and beach were completely masked with ice. So, we walked out as far as we thought was safe, and then we took a few more steps (to get a photo). The ice was like glass here. Slippery glass. So more like glass covered in oil. 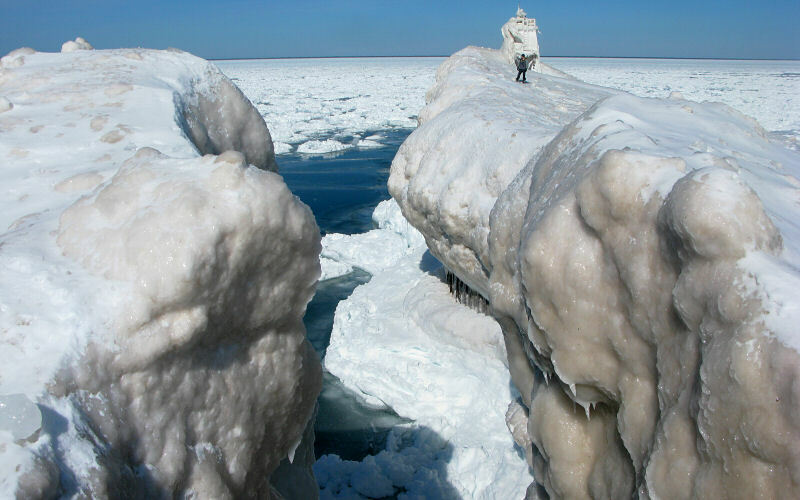 Oh yeah, and the ice at the end of the pier was also slanted towards the water quite a bit (this is where we stopped). 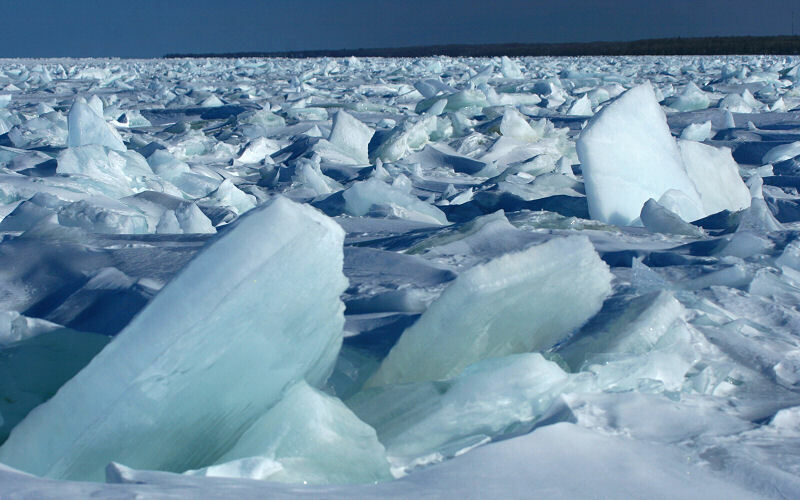 Ice as seen from the Grand Marais pier. 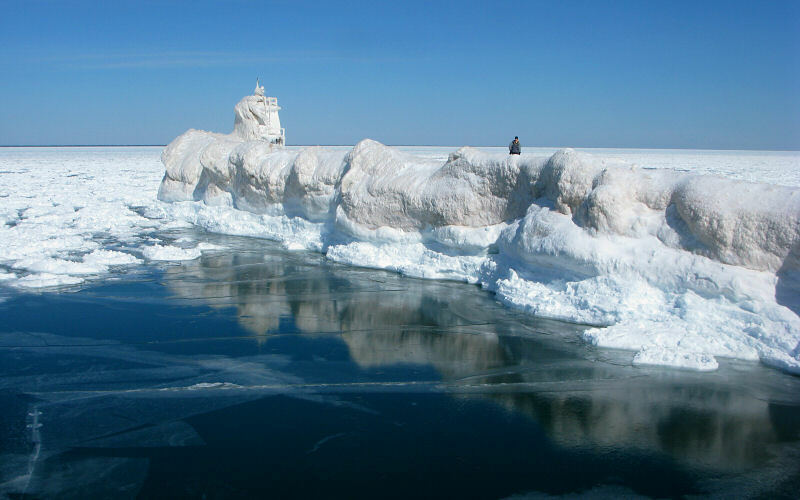 Ice shelf from the pier. From afar. 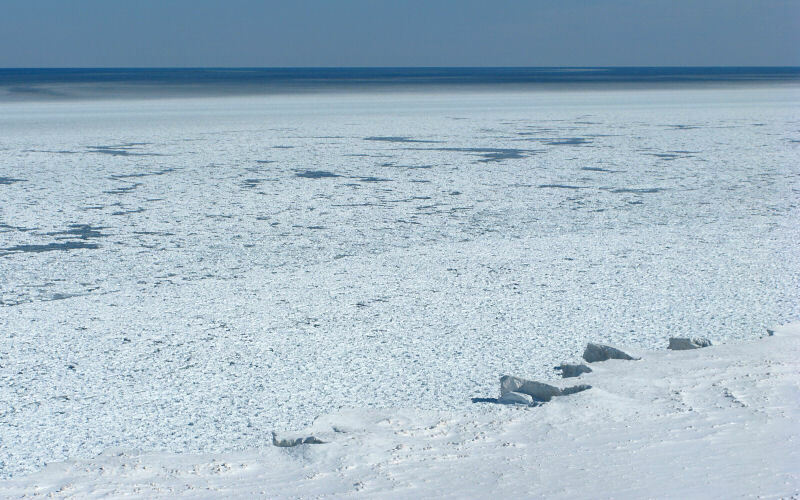 From this angle, you can see that the lake has coated everything in ice, except Kai. 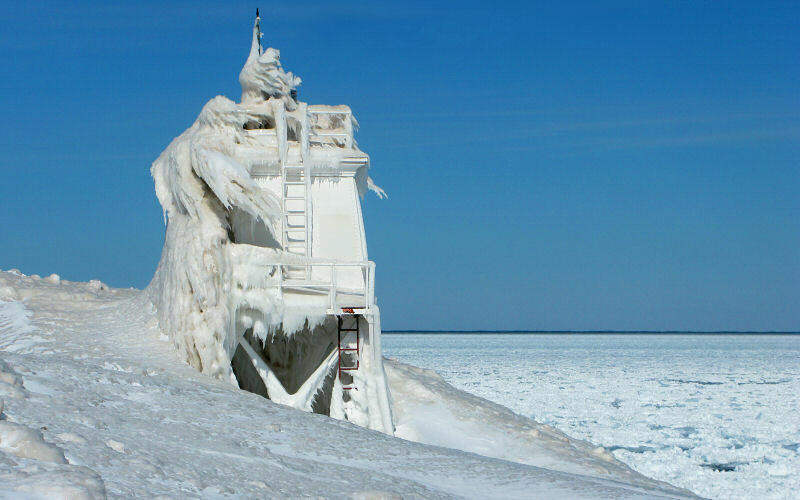 This light normally stands 34 feet above the pier but it was buried in about 15 feet of ice. 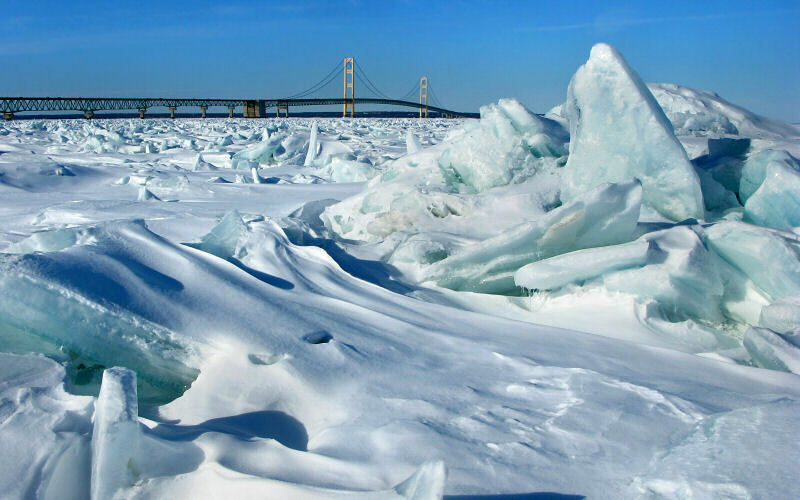 See what it looks like in summer. 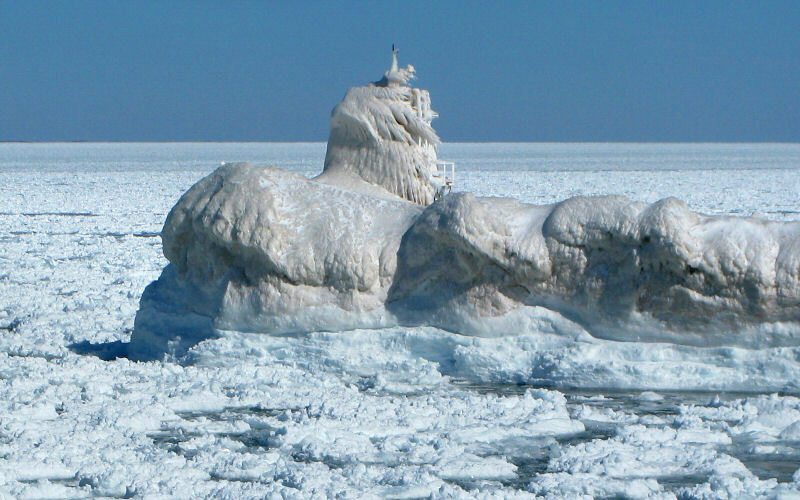 From this angle, the lighthouse is barely recognizable. 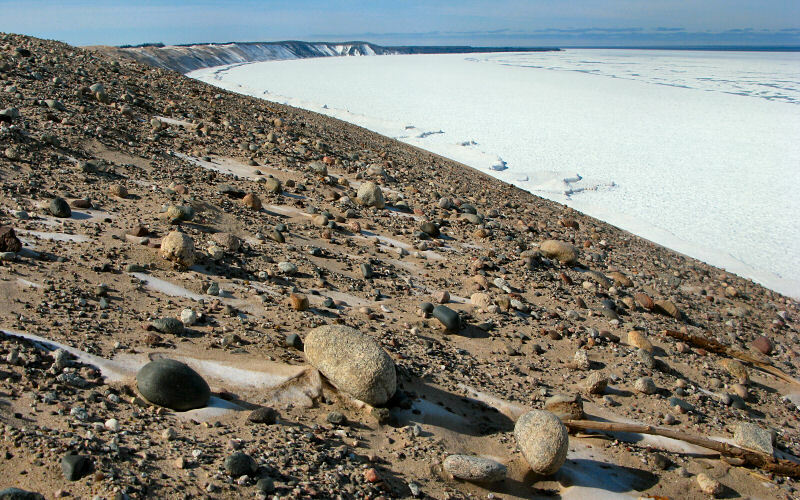 Left: This kind of gives you an idea of how high the ice gets built up above the beach. Right: Me below the ice pile (Photo by Kai). Me on the ice shelf (Photo by Kai). 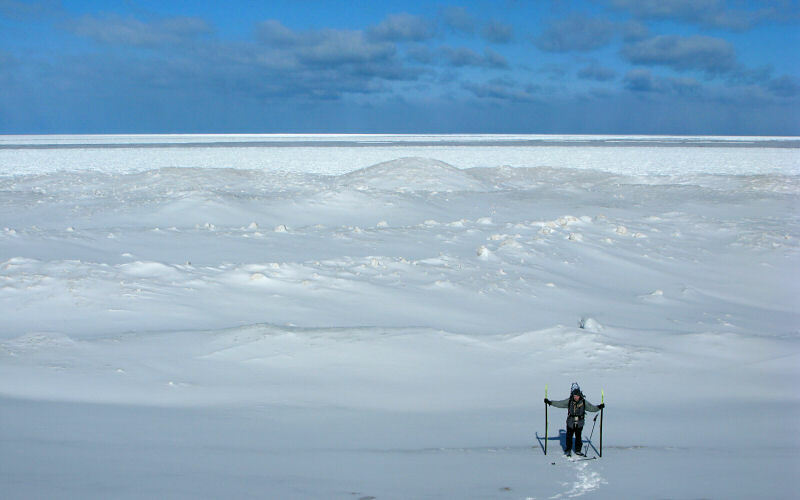 Me on the ice shelf. Our best estimate is that it was about 30 feet tall (Photo by Kai). 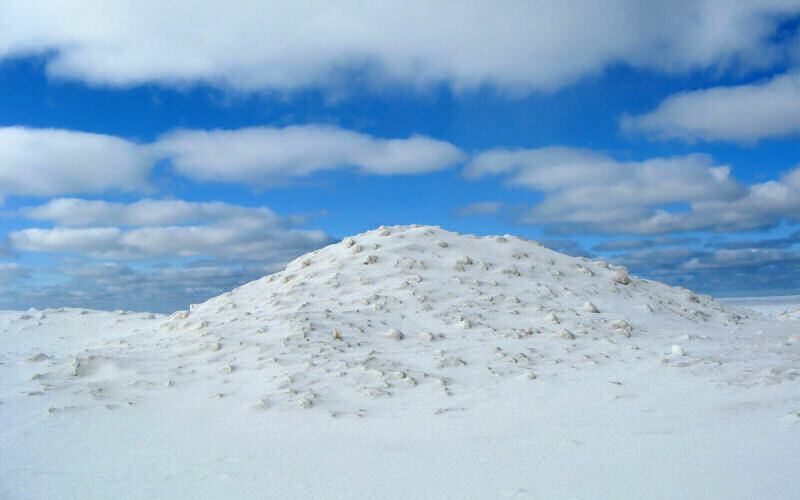 A pressure ridge (Photo by Kai).